As much fun as the kids would have blowing soap bubbles on the windows, this isn’t what we’ll be talking about. Sorry kids, put the bubble wands away. We’re going to be talking about the stuff that comes in the box when you buy items from the Internet. This is the same stuff that Grandma sits around squeezing as a stress reliever, and a general annoyance to those around her. If you haven’t guessed, I’m talking about Bubble Wrap, but we’ll get to that. R-value is a measurement of thermal resistance and measures the ability of heat to transfer from one side of an object to another. As a benchmark, one inch of solid wood has an R-value of 1 and a single pane window has an R value of 0.8. This doesn’t sound like much when a normal wall can have an R value of 13 or more. With air leaks and gaps in the insulation or thermal bridging; keeping the heat in or out (depending on the season) can be a daunting task. Luckily, we can easily help the windows without blocking all the light that comes in! All it takes is a little mist of water and some bubble wrap. It seems that the larger bubble wrap has a better insulation value. You could purchase the wrap (which would get quite pricey especially if you purchased it from UPS or at your local Post Office), or you could go to a furniture retail store, furniture rental shop, or even places that sell large items. They seem to just throw this untapped resource away! First, measure the windows and cut the bubble wrap to the exact measurements. Next, take some water in a spray bottle and mist the window. 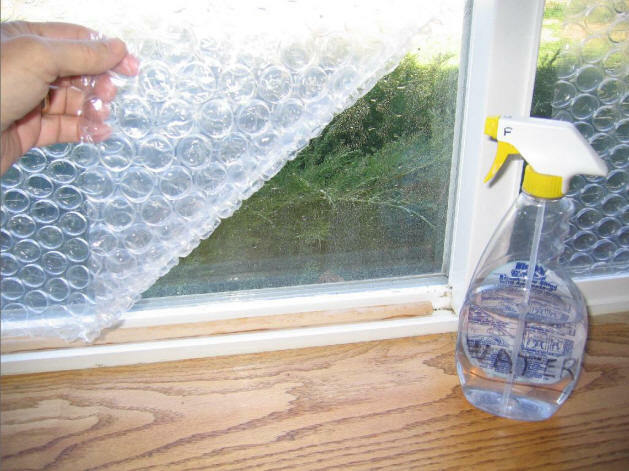 Then, turn the bubble wrap bubble-side toward the window, align up the wrap to the window and gently press the bubble wrap to the window, giving a good seal. The water acts as an adhesive that doesn’t stain or discolor the window or the bubble wrap. If the bubble wrap doesn’t want to stay, you could try using small bits of double sided tape in the corners to hold it in place. After the end of the winter season, you could take it down. Make sure you label each bubble wrap section and then have a corresponding guide to remind you how to put the bubble wrap back next year. This way you could keep reusing the same wrap year after year. You could also just leave it up year round to take advantage of the added insulation during the summer months to keep the heat out. The wrap can last upwards to 5 years when on the windows year round, even longer if you took it down at the end of the winter season. To figure out how much Degrees a Day climate you would have, subtract the lowest temperature outside from the temperature inside. For example, 70F (inside) – 15F (outside) is a 55 degree-day. Multiply this by the amount of days your area is below 65 degrees outside. You could take measurements to add up all of the days to get an exact amount, or estimate the temps throughout the year. The bubble wrap has a measured value of R of 0.65 from the tests that were done by Gary. 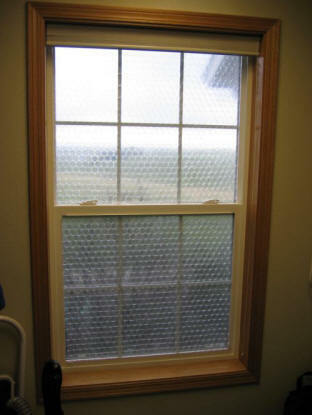 This gives you close to a 45% reduction in heat loss per window. I know its not crystal clear, but it could be a perfect idea for unused bedrooms, skylights, or even windows that were in a loft that were not being used for a view, and could use the added benefit of some extra insulation without blocking out the sunlight where you need it. Next story How to pump water without electricty! Previous story Hydroponics without using pumps: Is it possible?